Mark Selby vs Mark Williams (Decider) Dafabet Masters 2018 | Round 1. World number 1 Mark Selby suffered an early heartbreaking 1st round defeat by Mark Williams in the opening match of the 2018 Masters at London’s Alexandra Palace. Williams won a tense deciding frame to take a 6-5 victory and reach the quarter-finals. “I am over the moon and I’m playing a hell of a lot better than I’ve done for many years.” Williams said. 42 year old Welsh Mark Williams have won the Masters in 1998 and 2003 and he has been in a good form last year having won the Northern Ireland Open 2017 in November (his first ranking title in six years). Selby, in comparison, has been struggling to stay in form since winning the 2017 International Championship, suffering early exits in the first 2 Triple Crown events of the season. In the deciding frame, Williams had his first chance to clear the table and made 39 before missing a red to a top corner due to some distraction in the crowd. 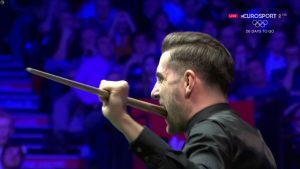 Selby had an opportunity to clear the table as he scored 44 before missing a tough last red along the top cushion leaving it in the jaws of the pocket. Williams took this opportunity and cleared the table to reach the quarter-finals. Masters Snooker 2018: Who will win? The Masters 2018 sees the top 16 best snooker players in the world. Ronnie O’Sullivan is the favorite to win and retain the title he won in 2017. Steve Davis believes the 7 time Masters champion Ronnie O’Sullivan is in top form. “He’s an even more mature player than he has been in the past, it’s astonishing to think that even into his 40’s, he’s still the most feared player.” Steve said. The Masters runs until Sunday, 21 January 2018 and the winner will take £200,000. Who’s your favorite to win? Let us know down below.